↑ "Drugs that physically interact with Beta-adrenergic receptor kinase 1 view/edit references on wikidata". 1 2 Pippig S, Andexinger S, Daniel K, Puzicha M, Caron MG, Lefkowitz RJ, Lohse MJ (1993). "Overexpression of beta-arrestin and beta-adrenergic receptor kinase augment desensitization of beta 2-adrenergic receptors". J. Biol. Chem. 268 (5): 3201–8. PMID 8381421. 1 2 Pitcher J, Lohse MJ, Codina J, Caron MG, Lefkowitz RJ (1992). "Desensitization of the isolated beta 2-adrenergic receptor by beta-adrenergic receptor kinase, cAMP-dependent protein kinase, and protein kinase C occurs via distinct molecular mechanisms". Biochemistry. 31 (12): 3193–7. doi:10.1021/bi00127a021. PMID 1348186. ↑ Benovic JL, DeBlasi A, Stone WC, Caron MG, Lefkowitz RJ (1989). "Beta-adrenergic receptor kinase: primary structure delineates a multigene family". Science. 246 (4927): 235–40. doi:10.1126/science.2552582. PMID 2552582. ↑ Penn RB, Benovic JL (1994). "Structure of the human gene encoding the beta-adrenergic receptor kinase". J. Biol. Chem. 269 (21): 14924–30. PMID 8195124. ↑ Raveh A, Cooper A, Guy-David L, Reuveny E (November 2010). "Nonenzymatic rapid control of GIRK channel function by a G protein-coupled receptor kinase". Cell. 143 (5): 750–60. doi:10.1016/j.cell.2010.10.018. PMID 21111235. ↑ Premont RT, Claing A, Vitale N, Perry SJ, Lefkowitz RJ (July 2000). "The GIT family of ADP-ribosylation factor GTPase-activating proteins. Functional diversity of GIT2 through alternative splicing". J. Biol. Chem. 275 (29): 22373–80. doi:10.1074/jbc.275.29.22373. PMID 10896954. ↑ Premont RT, Claing A, Vitale N, Freeman JL, Pitcher JA, Patton WA, Moss J, Vaughan M, Lefkowitz RJ (November 1998). 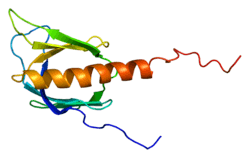 "beta2-Adrenergic receptor regulation by GIT1, a G protein-coupled receptor kinase-associated ADP ribosylation factor GTPase-activating protein". Proc. Natl. Acad. Sci. U.S.A. 95 (24): 14082–7. doi:10.1073/pnas.95.24.14082. PMC 24330 . PMID 9826657. ↑ Day PW, Carman CV, Sterne-Marr R, Benovic JL, Wedegaertner PB (August 2003). "Differential interaction of GRK2 with members of the G alpha q family". Biochemistry. 42 (30): 9176–84. doi:10.1021/bi034442+. PMID 12885252. 1 2 Wan KF, Sambi BS, Tate R, Waters C, Pyne NJ (May 2003). "The inhibitory gamma subunit of the type 6 retinal cGMP phosphodiesterase functions to link c-Src and G-protein-coupled receptor kinase 2 in a signaling unit that regulates p42/p44 mitogen-activated protein kinase by epidermal growth factor". J. Biol. Chem. 278 (20): 18658–63. doi:10.1074/jbc.M212103200. PMID 12624098. ↑ Yang XL, Zhang YL, Lai ZS, Xing FY, Liu YH (April 2003). "Pleckstrin homology domain of G protein-coupled receptor kinase-2 binds to PKC and affects the activity of PKC kinase". World J. Gastroenterol. 9 (4): 800–3. PMID 12679936.